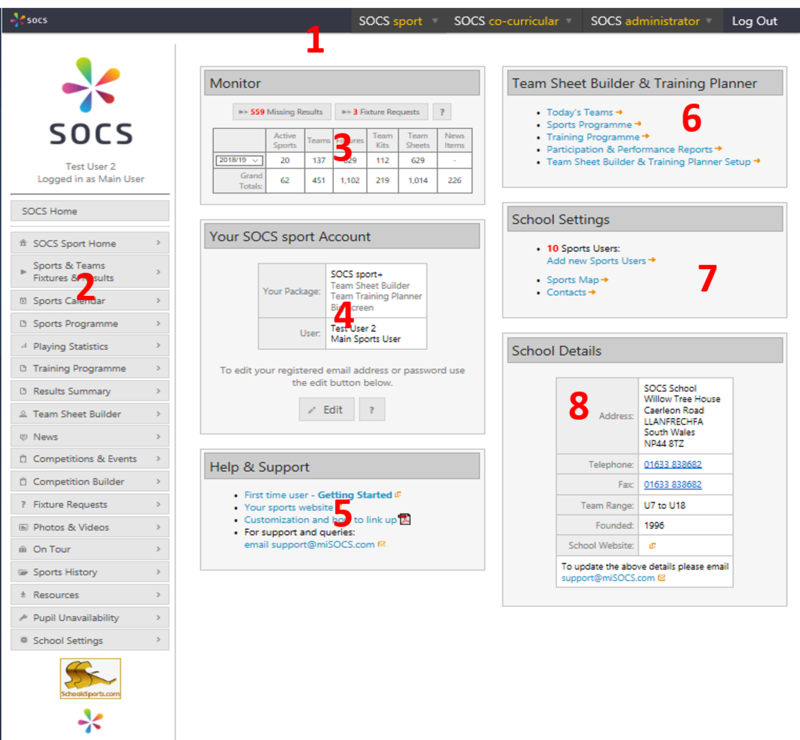 Once you have logged in you will see the home page of your SOCS sport control panel. This is the starting point from where you will find all the main features. Header. The header is always visible in every web page you visit within the SOCS control panel, allowing you to quickly return to the home page, acquire help, visit your sports website or log out. Main Menu. If you do not have the Team Sheet Builder or Team Training Planner add-on modules then certain menu items will not be active. Monitor. This shows the calendar for the current month, and highlights all days where sports fixtures or events are active. There is also a table showing a high-level overview of your sports and fixtures. Your SOCS Account. This shows your SOCS user account details. Help & Support. This section contains links to other documents where you will find help as well as our email address if you need to contact us. Team Sheet Builder & Training Planner. Here you will find links to Today’s Teams and the features included with these add-on modules as well as instructions. School Settings. This shows the number of sports users and links to the main school settings editors as well as billing information, which is only available to the main sports user account holder. School Details. The schools address and other registered details are shown here. Notify any changes to support@misocs.com.